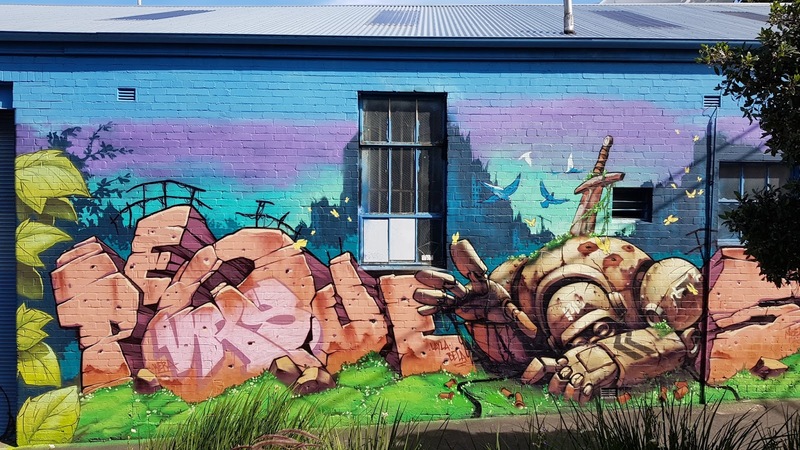 This is part of a mural on the side of a shop on the corner of King Street and Rochford Street, in the inner city suburb of Newtown. The artwork was created by PequeVRS and Sykoh. This wall has featured a number of artworks by these artists over the years which can be seen here, here and here. Peculiar. The first thing that comes to mind is Excalibur, but that's no stone it's sticking out of! It's certainly rather grim compared to his other works. Love this one Jim. Lot's of colour and a nice 3D effect. nice! kind of reminds me of the iron giant. Thanks for linking to Blue Monday! It's like he's been in a battle and he's been defeated. Beautifully rendered, but not a happy subject. When you enlarge the photo it looks great with a 3D effect. Thanks taking part Jim. I managed to capture a few murals on my visit to Sydney last week, I can always spot something out of the corner of my eye, lol. I do love street art. We have quite a few around our city.